My sewing time seems to always be in fits and starts. I rarely get to finish a project in one sitting. This leads me to make little things that I can finish fairly quickly. As a result, I’ve been making lots of little things. The other day I found a Melissa and Doug wooden kitchen cook set on clearance at a local shop. This has sent my creative juices flowing in the way of play food. 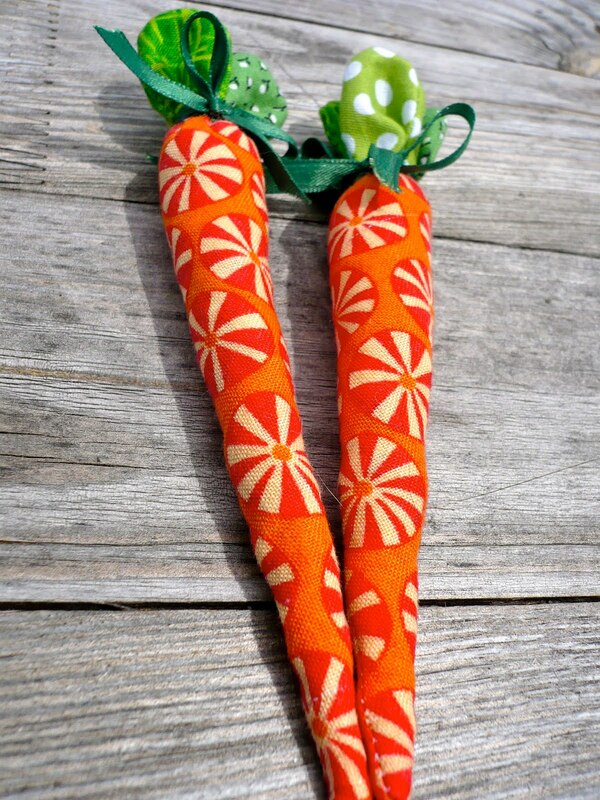 I’ve made some crochet play food in the past, but never any sewn. I don’t normally have orange fabric laying around, so I used some leftover orange fabric from making last years Halloween candy buckets. It was the only orange fabric in the house! The different greens are a little bit of everything. I used 3 green fabrics for the leaves, scraps from a quilt, a stash fat quarter, and some other leftover fabric. The ribbon was a length of green that once held up a Christmas stocking to our banister. 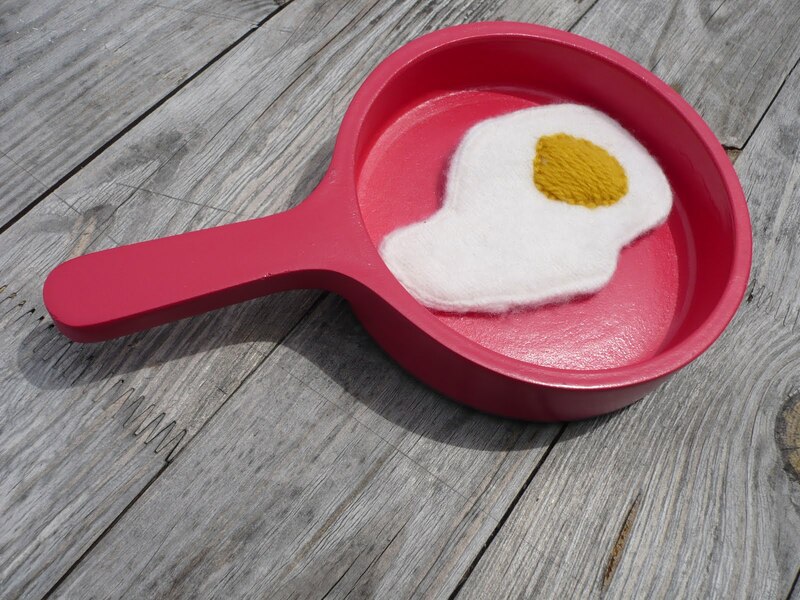 I had more of the white cashmere felt scraps left, so I just cut out a couple of pieces to make a fried egg. I didn’t have any yellow or egg colored felt, but I had some wool yarn that would suit. 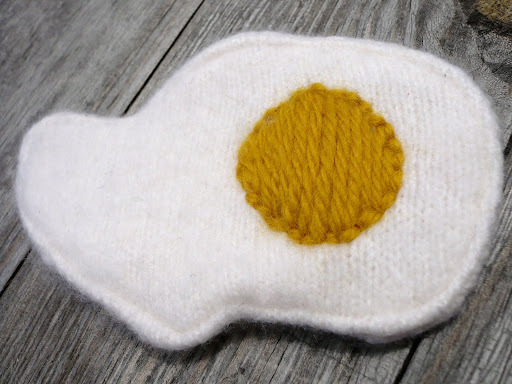 A little bit of embroidery later and some machine sewing and we have a fried egg! Here it is frying up in Little Bit’s pan. The great thing is I didn’t have to buy any of the supplies to make these. Great for stash busting and using up small scraps. I’m hoping to get some more play food made. Little Bit really likes his pots and pans. Maybe I’ll try out something a little harder next time. This entry was posted in fabric, kitchen, Little Bit, Reclaimed, repurpose, sewing, toddler, up-cycle. Bookmark the permalink.